The SERDI 2.0 is using the original SERDI 100 HD workhead with the double air cushion and spindle, operated by a motor of 1.5 Kw. 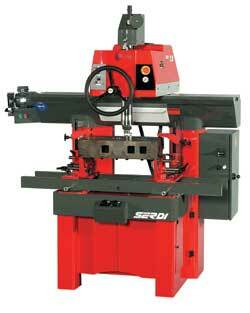 Comparing to the new SERDI 100 HD, the table bed is smaller but can carry heavy duty cylinder heads. The SERDI 2.0 machine is designed particularly for machining of medium and big diameter seats such as automotive and small diesel engines. Recommended for guide diameter bigger than .275" / 7mm.